Until their discovery and naming, all superheavy elements (up to 999!) have been assigned temporary names by the IUPAC. 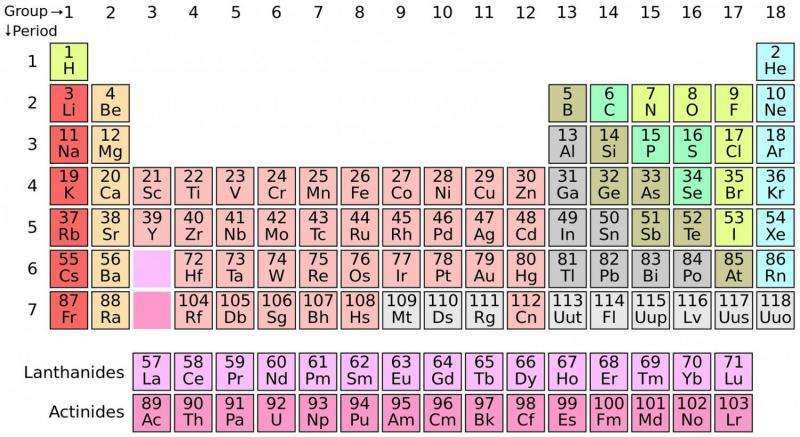 Element 113 is known as ununtrium (Uut), 115 is ununpentium (Uup), 117 is ununseptium (Uus) and 118 ununoctium (Uuo). These names are not actually used by physicists, who instead refer to them as "element 118", for example. Those superheavy nuclei that have been created artificially have decay lifetimes between nanoseconds and minutes. But longer-lived (more neutron-rich) superheavy nuclei are expected to be situated at the centre of the so-called "island of stability", a place where neutron-rich nuclei with extremely long half-lives should exist. Currently, the isotopes of new elements that have been discovered are on the "shore" of this island, since we cannot yet reach the centre. Atoms of superheavy elements are made by nuclear fusion. Imagine touching two droplets of water – they will "snap together" because of surface tension to form a combined larger droplet. It turns out that this only happens in a few "lucky" collisions, as few as one in a million. They made use of unique ANU experimental capabilities, supported by the Australian Government's NCRIS program, to measure fission characteristics for several nuclear reactions forming element 120. The results will guide future experiments in Germany to form the new superheavy elements. b) These superheavies are all radioactive and extremely short lived. If they weren't they'd still be around in sizable numbers and would not need to be produced artificially. You know the stability depends upon the containment. Also each stable atom has a mirror image, I should say reverse the "+" and "-" items, mirror image would be incorrect. So we should state an "earthly stability" so we don't confuse what is stable within a sun or a black hole. So first we must understand containment, what holds a neutron together, or should we say what field separates the electron and proton and what radiation is created during this separation. I mean does it spiral away, or move linearly, juz say'n. Calculate the near field of each particle as a coulomb force, simple; forget the standard model, its wrong! Forget GR, fusion doesn't work that way, low energy, little steps so the particle can't fly away. A small gap, find it using coulomb. The "+" and "-" are identical only change the charge, no "earthly measured mass". Mass is a result of the fields. Not a new science, only a correction! Remember, I told you so. Information is free, dude! To become a thinker requires proper genetics, those who were last to come out of the last ice age, don't seem equipped with about 30,000 years, I figure if they can't walk out the ice to the south a little earlier then, then question! How were they relating to there environment. They always had a tinge of magic to there thinking. This disease spread throughout the world via barbarism that destroyed great kingdoms, now ask themselves, how were the pyramids built. So they could not read and thus destroyed the ancient worlds collection of information written Ancient Hieroglyphics. Give me a break upon your silly comments without thought. You have no idea what this impresses upon society or as a group working together. Why are you like this, really!? Do a calculation using coulomb and your most popular measurement based upon the diameter of the electron and the proton. See where are the stable states. Simple algebra and geometry. Look at the field as you move backward in time, or simple geometry on the angle and location with a surrounding field. I call it containment it also implies non-containment. Based upon energy or simply vector velocity, etc. does one patent that! It needs to be out there to offer ways to use it, that allows patent. Screw the paper. This is my paper. I don't wanna do all that work? It's freaking obvious. This is a hell of lot more fun. I don't even want to get into capitalism. I rather a great "spirit" with a great "ba"; no need for money. An intelligent society... All who seek a high worth, ideas based upon the great pharaohs to know how to negotiate, to define value relative to the whole not the individual. Get it? Your definition of "Civilization" using a non civil measure? Not a persons worth, everyone has worth, what's wrong with that? We all work together for a common cause; but. that particular genetics, think about it. ??? Look at the future with truth and not lies and misinformation, see! And God forbid we continue with insulting people, teach the kids!